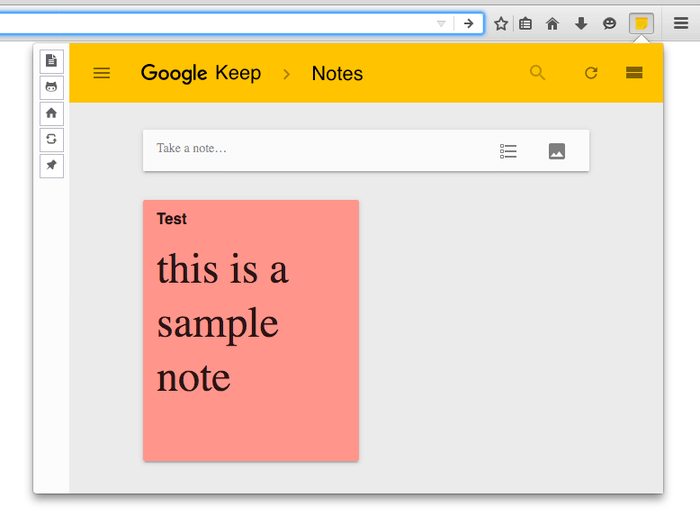 "Panel View for Google™ Keep" is a cross-browser extension designed on top of Google Keep to store your notes, lists and photos. Using this extension, the awesome Google Keep can be accessed from a panel view instead of having to open it inside a browser tab which might distract you from what you are doing. This extension's sole purpose is to bring a better clipping method to users of Google Keep and it is NOT THE INTENTION to mislead anyone to think this is the official extension. How can I add/remove the inserted toolbar button in Firefox? To add or remove the toolbar button, right-click on a free space in your Firefox toolbar and select "Customize...". Now you can drag and drop the button to a new position. Firefox user interface is very flexible in terms of customization. To learn more, I recommend to take a look at a Comprehensive Guide to Firefox Customization blog post. How can I access to extension's settings? How can I use Google Keep after installing this extension? Please take a look at this blog post to get familiar with Google Keep; Four Ways To Use Google Keep Daily. How can I uninstall the Panel View for Google™ Keep from my Firefox? To uninstall Panel View for Google™ Keep go to Firefox -> Add-ons -> Extension Name, then press Uninstall button. Why there is no "save" button when I edit my notes? My panel is messed up. Can I restore the default view? Yes, in Firefox browser, open about:config in a new tab and hit Enter. Now search for extensions.jid1-fwmZMpUsa7AXKc@jetpack.google-keep-url preference and double-click on it. Replace the existing url (which is the currently default URL) with the default value which is "https://keep.google.com/keep".